Being a Mindful hero sometimes means risking your life in order to save another and that’ s exactly what happened when a 43-year-old man named Michael Patterson jumped into a creek to save a four-year-old girl. Unfortunately, his selfless act may have cost him the ability move from the waist down. 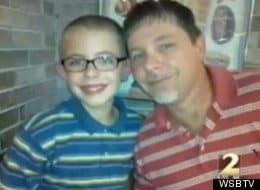 In early June, Patterson and his nine-year-old son, Cole, where spending time at Euharlee Creek in Rockmart, Georgia when they heard screams from Carlissa Jones, whose daughter, Javea, was floating downstream with her head underwater. Patterson dove in head first to save the little girl. He was able to rescue her, but the creek was shallow and he ended up breaking his neck and injuring his spine. When Patterson was rescued he was floating in the water and he nearly drowned. Patterson was rushed to the hospital where he fell into a coma and the bacteria-infected water from the creek, which had filled his lungs, resulted in him developing pneumonia. The doctors have predicted that Patterson will remain paralyzed from the waist down for the rest of his life. His family would like to transport him to a hospital that specializes in spinal cord rehabilitation, but Patterson’s new construction job doesn’t provide health insurance. His family has also been struggling to pay for his father’s cancer treatments, so they are low on funds. Patterson’s heroic act has reminded millions about the extreme importance of water safety. According to the CDC, ten people die every day due to unintentional drowning. In fact, drowning is the fifth leading cause for unintentional injury death in America. Javea is a very lucky little girl. Carlissa Jones says that because of Patterson her daughter is safe and that he is “a godsend.” Patterson’s story has inspired many including local filmmaker Tyler Perry, who donated $50,000 to help Patterson with his rehabilitation. Would you like to help this Mindful hero? Consider visiting this fundraising website. The Friends of Mike Patterson Trust has already raised over $86,000, but their goal is $250,000. You can also visit the Facebook page that friends and family have created in his honor.